During World War II, the U.S. Government asked Wilton Carlyle Dinges, founder of the Hanover, PA-based Electrical Machine and Equipment Company (now Emeco) to design a lightweight chair rugged enough to “withstand water, salt air and sailors.” That design became known as the Navy Chair (or the Model 1006 for purists) and today has become a staple of industrial-chic design. Now you can add “copycats” to that list after a legal dispute, involving a nearly-identical chair from Restoration Hardware called the “Naval Chair,” has been settled. 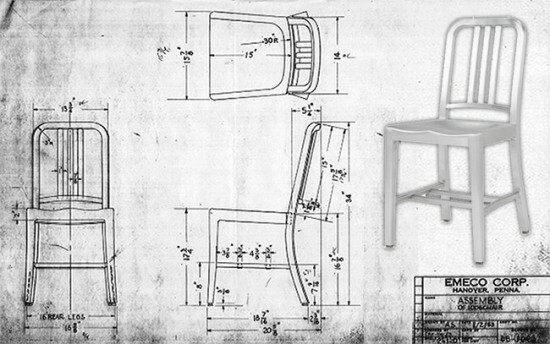 Emeco sued Restoration Hardware last October alleging infringement of Emeco’s trademark of the Navy Chair. “The irreparable harm caused by Restoration Hardware, an established company, to Emeco’s reputation and significant goodwill is massive, incomparable to that caused by a typical, small-time counterfeiter,” the company said at the time in a statement. The larger significance of this settlement is its implications to protecting the intellectual property of designers. Design copyright protection has been a contentious issue between designers, manufacturers, and counterfeiters—even reaching recently to the scale of architecture—and will continue to play out in coming years.